Over the years, traditional wisdom has supported the idea of a water body such as pond, lake or a fountain to provide cooling effect to the surrounding environment. 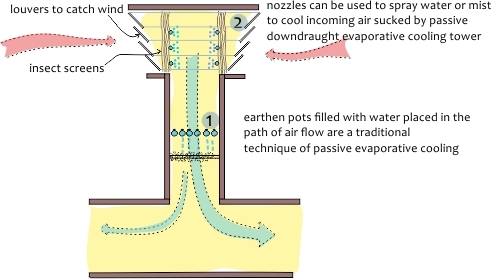 This effect lowers the indoor air temperature – a widely known concept of evaporative cooling. This phenomenon is largely witnessed in systems such as desert coolers in most Indian households. Evaporative cooling lowers the indoor air temperature thus lowers the energy cost for air-conditioning in buildings. Reduced energy load contributes towards meeting the NZEB design goals. However, evaporative cooling is mostly effective in hot and dry climate where the humidity is low. Air is in direct contact with the cooling media, water, in direct evaporative cooling. The most commonly used methods are water bodies and water sprays. Pools, ponds and water features immediately outside windows or in courtyards can pre-cool air entering the house. As water evaporates it draws large amounts of heat from surrounding air. In public buildings, water in pools and fountains can be used as a cooling element along with cross-ventilating arrangement of openings. Cooling towers The cooling tower may be used to evaporate, precool ventilation air for one or more air handling units (AHU), reducing the load on the mechanical cooling system. Evaporative cooling is most effective in hot and dry climates. Vegetation for evaporation: The evapotranspiration from one tree can save 250 to 650 kWh of electricity used for air-conditioning per year. Evapotranspiration from wet grass can reduce the ground surface temperature by 6-8°C below the average surface temperature of the bare soil. Use of porous materials: Roof materials can cause evaporative cooling effect e.g. The siliceous shale is able to reduce the roof surface temperature by about 8.63°C, as compared to mortar concrete. Passive downdraught towers catch hot ambient air through wind scoops at the top. This air is cooled either through mechanical systems like nozzle sprays or through passive systems like water filled vessels. The heavy cool air sinks to the bottom zone of habitable spaces. Efficiency depends on the temperature differential between the warm outside air and cool air inside the tower. Kamal, M. (2012 ). 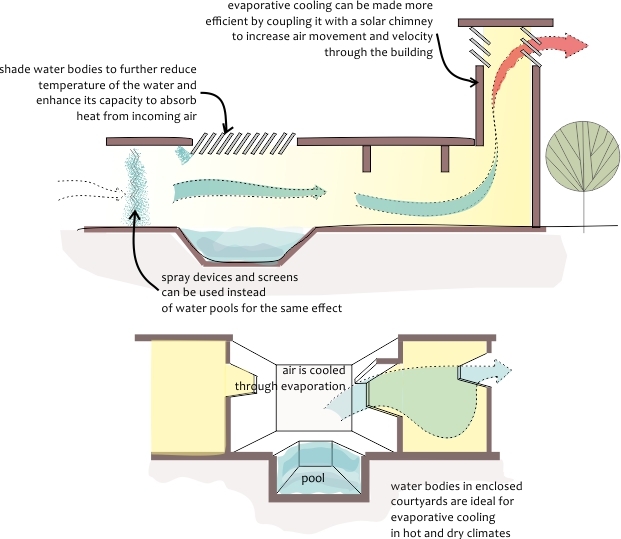 An Overview of Passive Cooling Techniques in Buildings: Design concepts and architectural interventions . Acta Technica Napocensis: Civil Engineering & Architecture , Vol 55 (84-97). Geetha , N., & Velraj, R. (2012). Passive cooling methods for energy efficient buildings with and without thermal energy storage – A review. Energy Education Science and Technology Part A: Energy Science and Research, Vol 29- 913 – 946. Evaporative coolers can replace mechanical cooling in hot-dry climates. In composite climates evaporative cooling systems can be used to reduce HVAC system use during early summer months when the temperatures are high and humidity is low. It has been calculated that temperature of 1 M3 of air will be reduced by 1° centigrade by the evaporation of 0-5 gm of water.